Published: Dec. 9, 2018 at 11:31 p.m.
Los Angeles Rams quarterback Jared Goff's fourth interception seals the Chicago Bears' win. 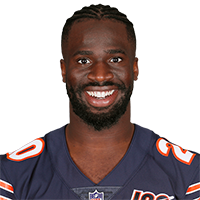 Published: Sept. 18, 2018 at 12:06 a.m.
Chicago Bears cornerback Prince Amukamara scores a defensive touchdown against the Seattle Seahawks after picking off Seattle Seahawks quarterback Russell Wilson in the fourth quarter. Published: Oct. 22, 2017 at 07:04 p.m.
Chicago Bears safety Eddie Jackson intercepts Carolina Panthers quarterback Cam Newton and returns it 75 yards for a touchdown.